Social networking is the biggest trend to hit the Internet in the last few years. Aided by the rapid adoption of smart phones, consumers are sharing their views about products and companies much more easily through Twitter, Facebook, blogs, and forums. This free-flowing viral conversation is a challenge and opportunity for your business. Unaddressed negative perceptions can easily spin out of control to become a public relations nightmare for your business. On the other hand, a timely, appropriate response to complaints or negative perceptions is seen as a sign of caring. eGain Social™ is a one-of-a-kind product for social customer service, knowledge harvesting and single-sourced social publishing, and reputation management. It enables you to monitor social networks such as Facebook®, Twitter® and blogs for customer queries, analyze their content, analyze search results for sentiment, route them intelligently, and post responses privately or back to the social cloud in media-customized formats. For instance, Twitter posts use shortened URLs and conform to the 140 character limit. When combined with eGain SelfService™ and configured appropriately, social knowledge is displayed as part of self-service portal searches. 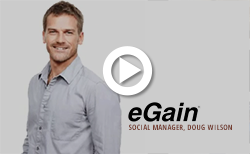 eGain Social is an integral part of the eGain Customer Engagement Hub Suite. Operational metrics available on social response SLAs, response time by agent or queue, topic trends, etc. Press clipping: Want to transform customer service? Question conventional wisdom!